DaVinci IQ continues to push the envelope - their latest vape is their most intelligent yet! Pure and clean taste, without wasting herb, is the best way to describe the DaVinci IQ. This sleek and ultra-portable herbal vape is another great device from DaVinci and they focus on taste more than ever with this one. Cool new features like "boost mode" and precision temp keep this one a step ahead of its competition, but the Bluetooth connectivity and glass tube mouth-piece option helps push this one past all others in this category. The DaVinci iQ is a good recommendation if you are wanting to pure and clean vapor from your dry herbs. It not only performs great, it also comes in a sleek and slim form making it a great stealthy vape mod if you’re looking for something that is not overly to bulky to carry around with you all the time. The DaVinci may seem expensive at first, but in fact, it is more durable than any other dry herb vaporizer in its category. It features conduction heating, a feature that allows the herbs that you are intending to use to cook evenly always at the same temperature. This means you are always going to have the same great taste all the time when vaping. The LED display is also another factor which reflects its quality and is one of the best features, as it allows you to see a real-time status of your vaporizer without opening the application or having to look at a very small screen. The battery life is very impressive. In fact, the DaVinci IQ provides you with over an hour use in a typical one-hour session. It also has an interesting use of internal haptic feedback, so the dry herb vaporizer vibrates so you need to charge it. If you are going to be in situations where you are always on long trips, the DaVinci IQ has a removable 18650 battery, which can be useful if you don’t always have a charger or access to a wall outlet. Even though the battery life lasts a long time for most, it does take some time to charge it fully. We found that it takes around 3 hours for it to change from 0 to 100%. The DaVinci IQ also makes use of ‘Smart Paths’ which can be downloaded onto your smartphone to expand the vape features with handy Bluetooth Integration. It provides far more customization when you are vaping and this can far provide you with an improved experience. You have full control of the temperature you want the herbs from start to finish. There is also a unique feature called ‘Boost Mode’ which allows a very rapid instant quick temperature change in case you want a quick hit. Holding the power button for a couple of seconds turns on this feature. As soon as you let go of this button the temperature will automatically increase until the button has been released. When it comes to durability the DaVinci IQ dry herb vaporizer has an air path that has a high shock resistance. It is made from Ceramic Zirconia, this is very strong and will guarantee many months of hard use out of one pipe. It also has great heat insulation which ensures that the heat focuses more on the dry herbs that getting wasted. The DaVinci IQ is a great dry herb vaporizer if you are looking for something that has cool features with smartphone integration. Its portable and a good size, so you won’t be having problems taking with you. The DaVinci IQ comes presented in a sleek looking box with a slide off the cover and comes with everything you need. In the box you will find the DaVinci IQ Vaporizer itself, a rechargeable 18650 battery, a USB cable, a flavor chamber, 10mm water pipe adapter, 2x Davinci Tools, a Davinci Key Chain, and a nice cleaning kit to keep everything tidy. 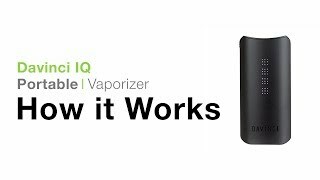 If you are serious about vaporizing dry herbs, the IQ is the best portable device on the market to date. It's sleek and compact form fits well in the pocket and is durable enough to take some drops. The main and most important feature about the IQ is its ability to produce an effective vapor quickly and efficiently. There is no wasted unvaporized herbs if you load it according to instructions. This fact alone is worth the extra cost of the IQ has as you will save money by not wasting your herbs. This device is recommended to anyone who wants the most efficient compact dry herb vaporizer money can buy and is willing to spend a few extra bucks for an effective, sleek, and tech-packed device that doesn't waste your herbs.